After spending all that time getting my cast iron skillet ready, we really needed to make something in it besides dinner. Everything tastes better when cooked in cast iron...so why not dessert? Leelee and I were bonding over a new cookbook I picked up from the library and she found several recipes we knew we had to make. None of them called for cooking on cast iron. Heck, none of my recipes called for cast iron cooking unless they involved camping and an open fire. It's no surprise that it was pretty darn amazing. Thick, gooey...soft on the inside and crispy on the edges. Her version used a bag and a half of chocolate chunks...needless to say, it's also very chocolatey. I'm not a milk and cookie person, but after a few bites, I had a small glass of milk, dunking the cookie wedge and savoring the deliciousness. Whisk together flour, baking soda and salt in a small bowl. In another bowl, beat together margarine, sugars and vanilla on medium speed, until smooth. Beat in eggs one at a time, then STIR with a spoon the flour mix, then chocolate chunks. Lightly butter a 10 inch cast iron skillet. Spread the dough in the skillet. Bake in the preheated oven for 40 minutes. Hi Micki! This looks so delicious and I love this idea! Thank you so much for joining us and sharing at Best of the Weekend! We love having you and will be pinning to our party board! Have a fantastic weekend and hope to see you next week! I love this! 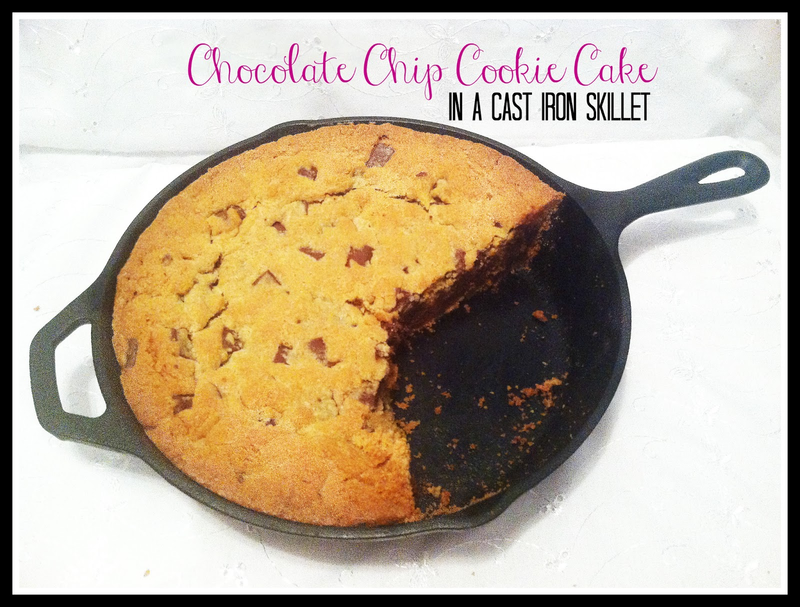 I don't own a cast iron skillet, but recipes like this make me want to get one! I would LOVE for you to share this over at my link party, Ginger Jamboree! I also have a great giveaway going on that you should enter!